Learning to navigate without a compass or GPS is an important skill to learn, especially for those who like to go hiking, trekking or even just for an occasional walk in the woods. You never know when you might find yourself in a situation where you are lost or hurt in the wilderness and don’t have these tools available to you. Learning these simple skills could be instrumental in your survival and save your life. There are three main things you can do to help determine your location and what direction you need to go in. The sun is a great reference for direction as it always follows a constant path. As you know, the sun always rises in the east and sets in the west. In summer it drifts a little to the north rising in the north-east and setting in the north-west. In the winter it drifts a little south rising in the south east and setting in the south west. As long as the sun is in the sky, you can tell which direction you are moving in. 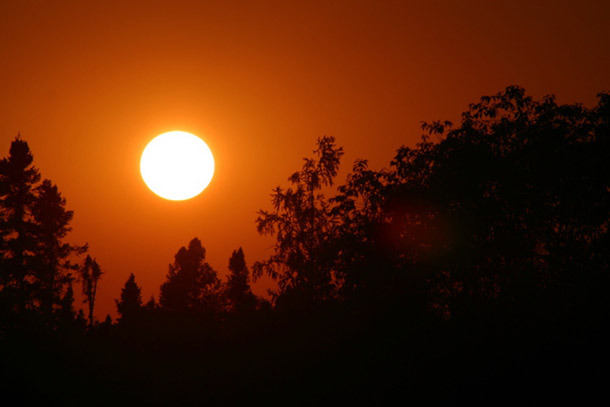 During sunrise and sunset is the easiest time to tell because the sun is close to the horizon, but what do you in the middle of the day when the sun is overhead? Find a stick and put it in a flat level area and point the stick towards the sun so that there is no shadow. After a few minutes a shadow will appear in the direction of either east or west depending on the time of day. 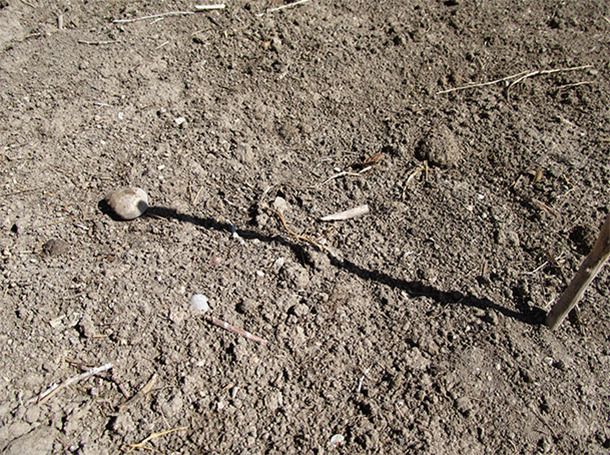 The other method is to put a stick in the ground vertically and mark the shadow it makes with a rock. Wait 15 minutes and mark the new shadow with another rock. Then draw a line from one rock to the other. This will give you the direction of east to west. Although some nights, you will not be able to see the moon, when it’s present, you can use the moon to navigate like the sun. Moonlight is the reflection of sunlight on the moon’s surface, therefore, the moons shadows are in direct relation to the suns position. 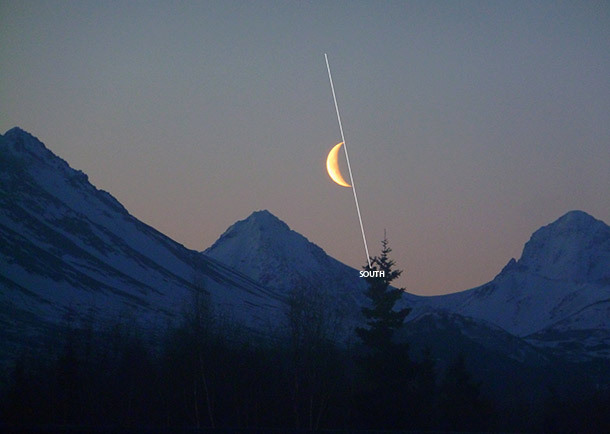 During a crescent moon, in the northern hemisphere you can tell which way south is by drawing an imaginary line across the moon pointing down to the horizon, with the line touching the tips of the crescent moon’s two points. If you live in the southern hemisphere, it would be the opposite and point to the north. This works well when the moon is high overhead but not as accurate when the moon is close to the horizon. East and west directions can also be determined as the moon follows the same path as the sun, rising in the east and setting in the west. With a crescent moon the bright side of the moon is always facing the sun which will give you an idea of what direction east and west is. If the moon rises before the sun sets, the bright side will be facing west. After midnight the moon’s bright side would be facing east. To be able to use stars for navigation, you have to first familiarize yourself with two important constellations; the Big Dipper and Cassiopeia. These two constellations are always present in a clear night in the northern sky. 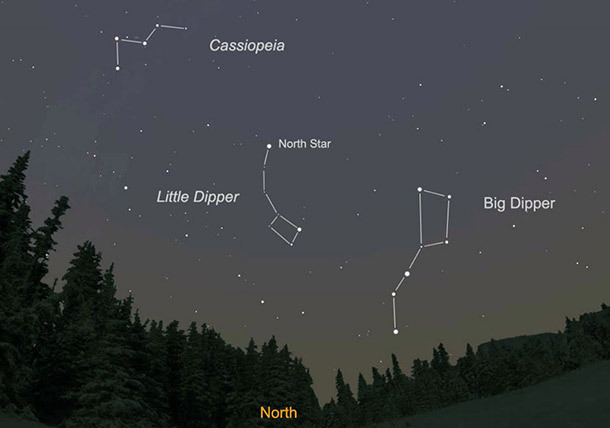 The Big Dipper is comprised of seven stars, when connected together resembles a large ladle or dipper. It is the most widely recognized constellation that many of us learn about when we are young. Cassiopeia on the other hand has five stars and is shaped like the letter W. The North Star is always in between these two constellations with the midpoint of Cassiopeia’s W pointing directly at it. It’s also the handle end of the Little Dipper. If you draw a line directly down to the horizon from the North Star it would point in the direction of the north. To find east west you can use the constellation of Orion. It rises in the east and sets in the west. Look for Orion’s belt which is the only three bright stars in the sky that form a straight line. This belt is the closest part of the constellation to due east and west. Outdoor activities in the wild are fun, especially when you are well prepared. So before venturing into the woods, or exploring an unfamiliar place, make sure to learn these simple skills in wilderness navigation and make sure you make it home safe.